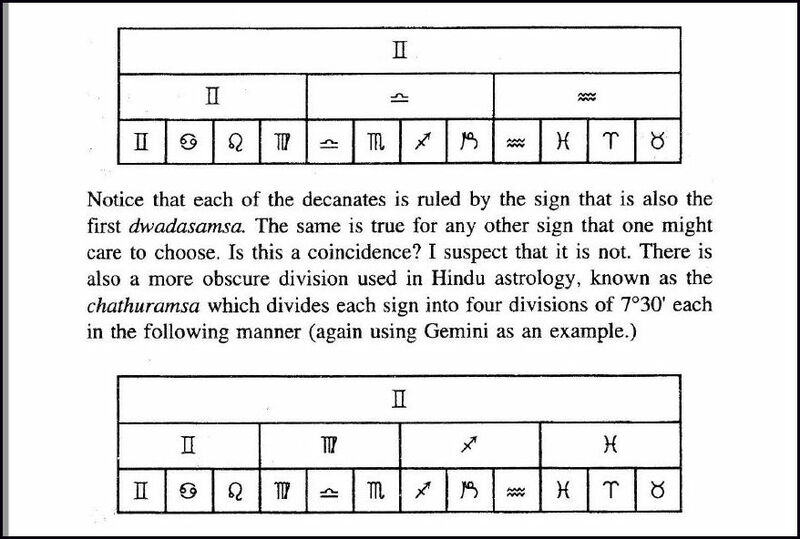 Something I have tried to do consistently on this site is to elucidate classical and ancient astrology and its place in modernity. The reputation of authentic astrology is largely in tatters. There are however signs of resurgence not only of astrology but the spirituality, and mysticism, to which it has always been yoked. This is occurring in the renaissance of traditional western astrology, but I believe we still have much to learn from Persian and Indian astrology. This has become my current area of research. “During the Piscean Age, the benefic Jupiter ruled the angles. Jupiter ruled both Pisces on the 1st and Sagittarius on the 10th, and thus, while there was confusion of hierarchical religious institutions and political institutions and while this inevitably led to hypocrisy, the Age was nevertheless one in which truth and philosophy mattered to men. The Piscean Age will, as this Aquarian Age unfolds, be seen as a halcyon period of semi-respite from the essentially malefic and spiritually destructive nature of life. In the Aquarian Age, the malefics once again rule the angles and with them returns the natural severity of worldly life. The modernity we know is the result of accelerated scientific advances and, extreme, fanatical forms of collective political movements, sometimes in the guise of liberalism. I have argued elsewhere that the China of Mao or Stalin’s USSR are akin to Nazi Party when it was rolled out as the National Socialist German Workers’ Party, The power comes like an iron fist from a single leader who promises food, jobs, stability, equality, sometimes cars, reason to replace religion, an overweening sense of being the only possible path one should take. The collective movements most famously of the 20th Century during the incursion of the Aquarian Age have for the most part been responsible for reducing the status of human beings to brainwashed drones, while the top of the pyramid or the center of the parties lives in opulence. This is essentially the global corporate model where impoverished people work in sweatshops to produces good that they could never afford. Aquarian Age collectivism is almost always fanatical. The state of the art in astrology is not unconnected to the illusions of the Aquarian Age – things often look good even when they are the complete opposite. It has often interested me that those who don’t like my dystopian views of the Age are perfectly happy to call it the Kali Yuga. I would go further to say that not noting the character of different ages is spectacularly unscientific. The opposing axis is Leo, affirming the sense of self beyond the collective, but adding an essential egoism. This concords with Zoller’s description of the Age. This contextual and practical examination is to a large extent a follow up from my recent article “On Earth, As It Is In Heaven.” The events, sensibilities, and zeitgeist of our times are underscored by what Robert Zoller referred to as The Novus Ordo Saeculorum. Astrological practise cannot be entirely separated from how one views the world. Capitalism, for example, is much more than business. It is an entire matrix of consciousness. It includes virtual slave labour in sweatshops in the third world. Capitalism writ large is a boot in the face of the most vulnerable people on earth. That is a kind of evil in my view. The Lord of the Age is Saturn. There are New Age people who believe that light can and does exist without darkness, that things must always be sweet, even though they clearly are not. Scientific materialists are not likely to care much for astrology at all, but who has not been touched by it? Those who put a high value on ancient and traditional sources will take yet another view of the subject, and so it goes. The astrological category of prediction is a good case in point. The question of prediction was raised in the previous article, in considering how the subject may best be explained and the work executed. To clarify, it is fair to say that all forms of astrology are indeed to one extent or another predictive. It should be clear that predictions are made with a combination of specialized skill on the subject on the part of the astrologer and by techniques developed over the millennia, always separating the wheat from the chafe. The Nativity, for example, studies the chart as if it were a seed. Other forms are more obviously so, although there is no great qualitative difference. The song remains the same. 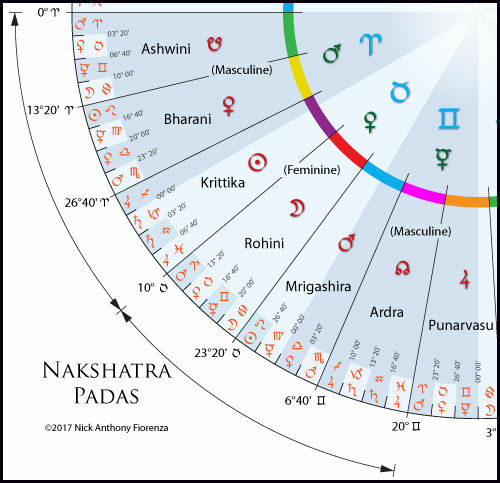 The astrologer must know many things before an accurate reading is realized. These include, in varying degrees, the physical, mental and spiritual elements that make up the native, For example, a knowledge of the humours allows for a reading that understands that a person with a strong melancholic humour will not react the same way as someone with a choleric one. There may be (and usually are) indications of potential health issues along the way. These and many other considerations help to give us a sound understanding of the vehicle in which the native is traveling in to navigate his or her world. 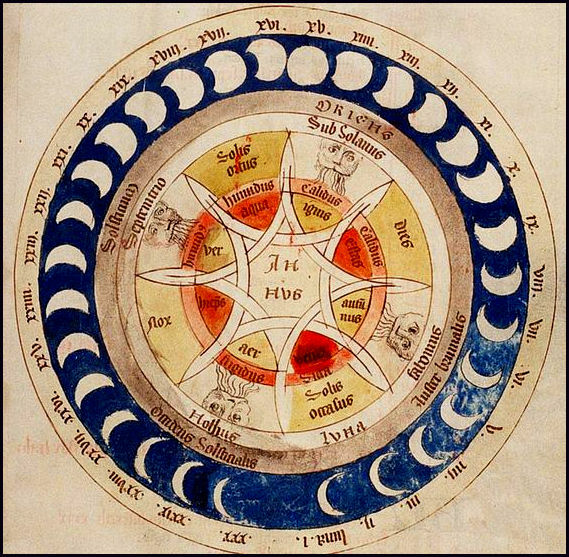 When we consider Mundane Astrology, we have a host of techniques; but frankly, one needs to know history, and usually geography and political movements. Mundane is, of course, best known as a predictive branch of astrology, but just as families of Saros cycles have meaning to us in the present, so too do cultures work on a continuum. In this respect, the prediction is Janus faced – looking backward as well as forward..Mundane astrology is challenging, but it doesn’t require multiple charts in bi-wheels, tri-wheels, Solar Returns compared to other progressions until one has a mass of data and no clarity. This is particularly noticeable in political mundane astrology For reasons that remain partly mysterious to me, predictions on who will win a given election are wildly popular. You will also notice that it is the norm for there to be as many wrong predictions as accurate ones. This tells us that the flipping of a coin would be equally useful if our question is simply “who will win.”This fact offends hubris and so it should Humility is a crucial cohabitant of wisdom. One of the main culprits here is the speed at which we are expected to work during this age of massively accelerated technology. Nevertheless, that cannot excuse a self-interest that makes the clear reading of a chart an impossibility. 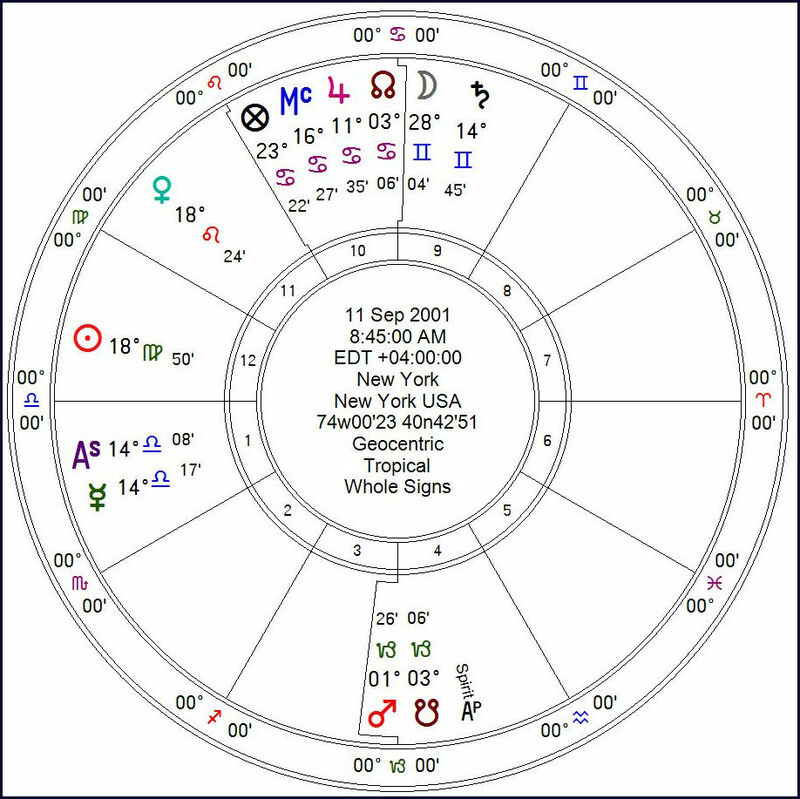 Make no mistake, we now live in an age where far more astrological charts are cast by the inept than the adept. This is almost entirely due to the incredible ease of using modern, sophisticated software programs, including free astrological calculation services available online. It is not so long ago, that every chart was painstakingly calculated by hand. Nevertheless, having drawn up the chart, no matter how one does it, it requires interpretation and to do that effectively takes many years to develop. Learning the essential significance of a given planet, luminary or sign is the beginning. Learning how these interact with each other in a whole chart is perhaps the second step. Beyond that is how humankind and all of creation is interconnected, A neo-platonist would call us monads. In my estimation, neither of these steps will be complete without a deep knowledge of the origins of this knowledge. Hermeneutics – A method or theory of interpretation – is an apt term in relation to the Art of Hermes. Hindus will say that the science of the stars was given at the time of creation and I’m not going to argue against that. Because most of human history has been transmitted orally, we cannot say with certainty when it began, or if in fact it always existed as part of being human – we do after all come from the stars – we are made of stardust. The oldest written work in the Indo European history is the Rig Veda, written in Sanskrit. The dates given for the creation of the text vary wildly. Some scholars suggest it was written circa 1500 BC. 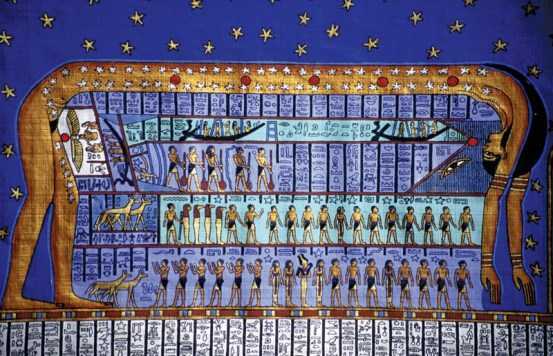 Others have claimed that it likely dates back to the 8th C. BC, based on astronomical configurations recorded in the text. There is no doubt that the first sections of the Rig Veda are very old indeed, consisting or oral transmissions. from sage to sage. Today, there are many people calling themselves astrologers who have no interest whatsoever in where the science came from or what are the underlying principles. The ancient world was far more connected than most people realize, As always, trade was the first cause of this. This brings China and the Silk Route into the fray very early on. However, the astrological tradition as we have known it benefitted from the close proximity of Persia to India. Persia, in turn, acts as a bridge to Babylon and Hellenistic world. 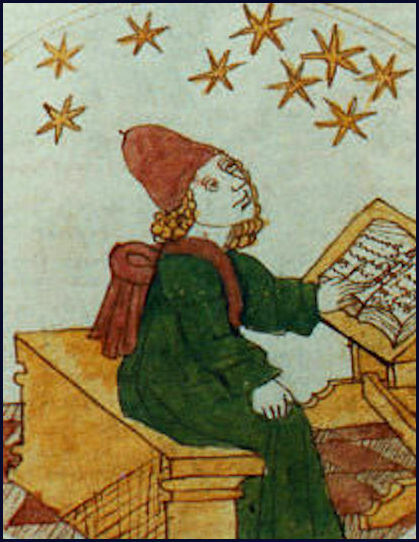 Platonism and Neo-Platonism were crucial to the understanding of the metaphysics underpinning astrology. All of these cultures mixed freely in Alexandria. It is interesting to read Plotinus and see both Platonic thought and what looks like Hindu metaphysics. It is impossible to ignore the extraordinary similarities between Shiva and Dyonysis. The presence at the School of Alexandria was a crucible for numerous philosophical schools from throughout the Mediterranean, North Africa, Persia, India, Babylon, and the entire Middle East. There were Hellenized Jews, Stoics, Pythagoreans and all of these cultures had an intense interest in the Heaven and how they may be interpreted, Last but not least was the tradition of the Hermetica, also quite seamlessly a part of this nexus. There is a healthy spirit of research into the earliest mentionings of the language of the stars. I believe that we are on the verge of new and powerful techniques that are also ancient. 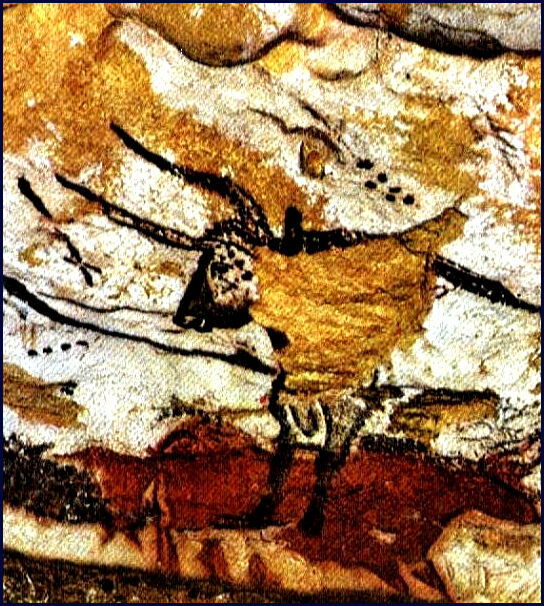 Much earlier than these philosophical systems we have the henge cultures of the Celts and cave drawings of Lascaux showing us that our earliest known ancestors watched the movement of the Heavens and organized their lives around constellations, the Lunar cycle and to a large extent, the cycle of Venus. It is, therefore troubling that people calling themselves astrologers, more often than not. have very little skill and almost no understanding or interest in the underlying structure and philosophical underpinnings of the art. The problem arises when the client is offered a vision of themselves that is divorced from the deeper wisdom potentially available in traditional readings. Again, we have a case of “I’m free to do whatever I want” with no real concern for the consequences. Considering the laws of nature is an antidote to that falsehood if observed. In the Aquarian Age, any mention of someone lacking adequate skill in anything might be cause for accusations of elitism. By the same logic, anyone with an avid interest in anatomy shouldn’t be prevented from performing any kind of surgery that strikes their fancy. Largely due to the internet, many people now claim to be astrologers who haven’t the faintest idea of on what astrology is based. Astrology has for the most part been reduced to the status of a parlor game. of essentially the same nature as newspaper Sun sign columns. 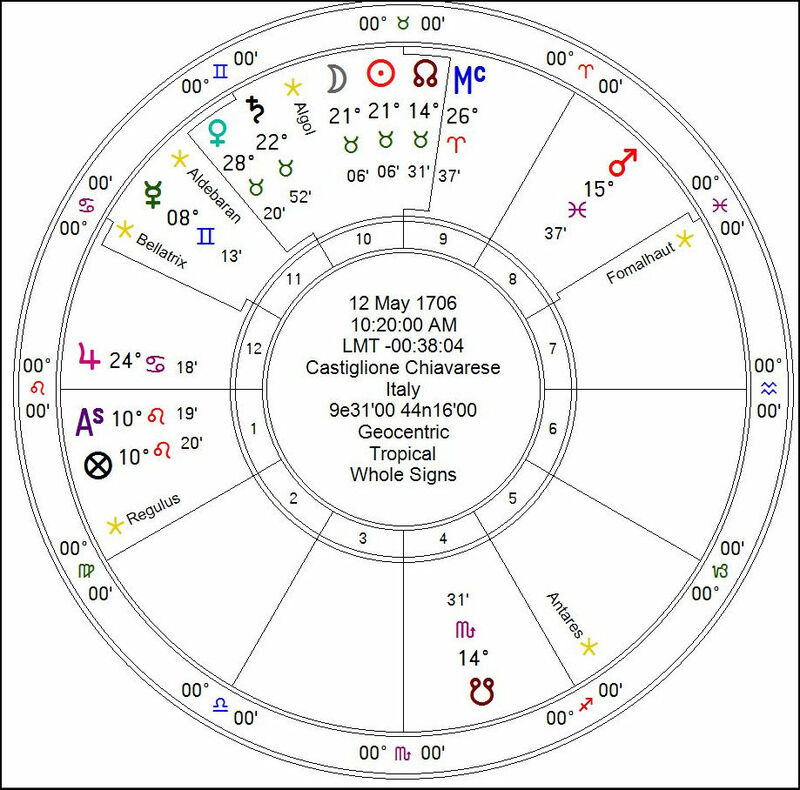 If your chart isn’t saying what you want it to say, you can keep adding planets, asteroids, hypotheticals, centaurs, Priapus, the Black Sun, three Black Moons and a partridge in a pear tree. This is precisely what many modern astrologers do. A King and a Monk (recto) Text (verso) Folio from the Uttaradhyayana Sutra said to be one of the final set of lectures given by Lord Mahavira before his liberation. Astrology has also been weaponized by people who are willing to use every last asteroid to make their political case. The central issue is there for all to see. For every competent, objective chart read, there are thousands that are neither competent nor even slightly objective. When one is in the position of assuming that anything can be anything in astrology, the art is easily abused and manipulated, becoming like a ventriloquist dummy, explaining every event as if in one’s own image. If one’s favored political choice lost, then the chart is portrayed as a trainwreck of malefic influences. If your candidate wins, the same chart might well be interpreted as the beginning of a golden age. It is true that some court astrologers in the past were subject to execution if they provided information the monarch wished not to hear, but these days incompetence. and political bias are among the usual culprits. 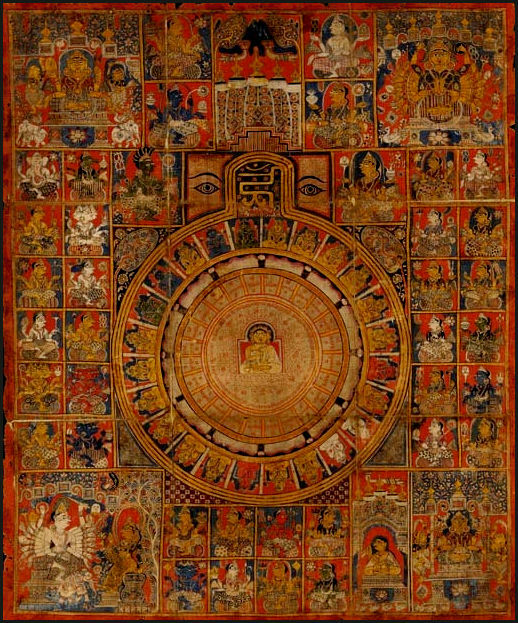 Jain Cosmic Diagram. Gujarat. Circa 1500. 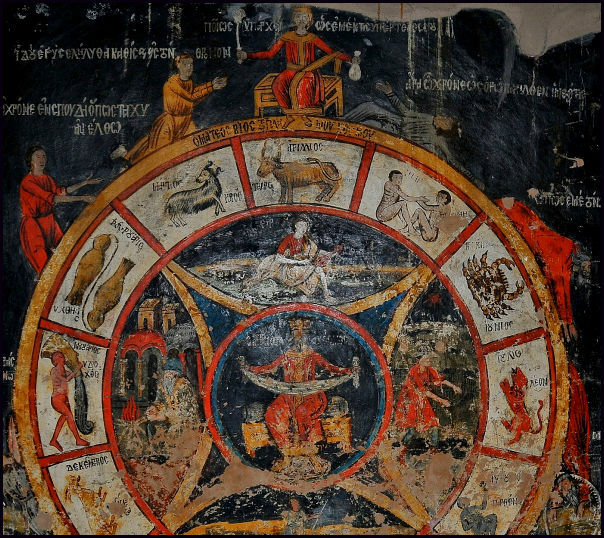 The beginnings of astrology were focussed on timekeeping and providing a powerful means to wed heaven to earth, in the words of Pico della Mirandola. This is the core of “on earth as it is in heaven.” In other words, the primary purpose and nature of astrology is that of a celestial dialogue. But we look through a glass darkly and perfect knowledge is forever elusive. The most engaging astrologers in my view are the ones with a strong sense of divine spirit at work. It is as if the entire soul is brought into play. The nature of modern prediction has also fallen prey to the sensibility, depredation, and demands of the modern news cycle, an entity purchased by global corporations who control the news to favour the needs of shareholders Massive artificial catastrophes, even presidential peccadilloes, are stoked by nothing more than sound bites and questionable sources – often by out and out prevarication and dissembling. Petty scandals steal the journalistic spotlight, while thousands of children are being slaughtered in a shadow war. Weather predictions or a medical prognosis, whether achieved through astrological techniques or by medical and meteorological means., are useful because they provide us with a chance to prepare for inclement weather or alert us to minor or serious health issues, for which we may find effective remedies or other means to avert a health crisis. Knowing who will be elected has rather vague uses when one considers how rarely political promises are made good. I do not denounce the practice for one minute, but I do think that context and relative worth are elements to be considered. It’s more like predicting the outcome of a horserace. Many people enjoy and use these methods and pursue these goals and there is nothing inherently wrong with them. From my point of view, however, they miss the point. 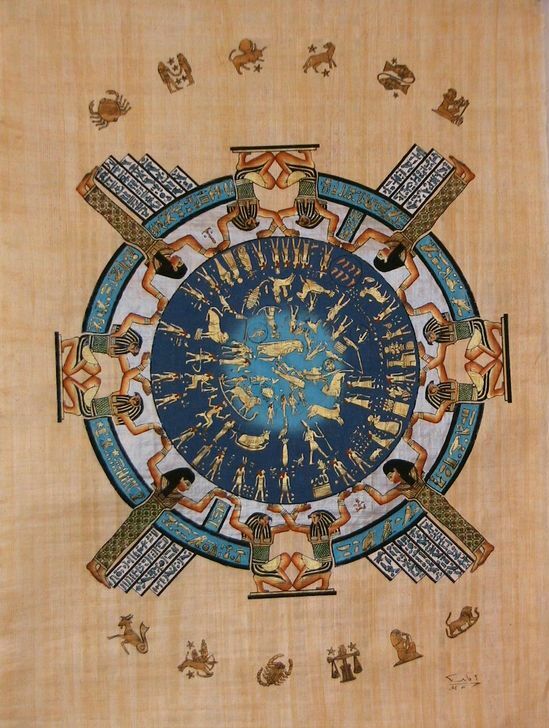 The Sky Goddess Nut body representing the Milky Way arching across the night sky. Part of my distaste for many election predictions is that they imply that it doesn’t matter if anyone votes because the winner has already been selected by fate. I have no particular problem with fate, but it would make a mockery out of democracy if taken to this level. Certainly, one can argue that fate can work through elections, but it does feel a bit like playing with loaded dice, To me, the subject of political elections is sometimes handled just as well by skilled journalists and even historians than by competitive astrologers with an ax to grind. Objectivity is better-called disinterestedness in this case. It is a state of mind that, as far as is possible, lacks either attachment or aversion, The stars guide us. We do not bend them to our will. To be fair, many clients come to us with specific questions. When the answer is not what they wanted to hear, they will keep asking the same question, as if at some point they will hit the jackpot. They cannot be blamed. The society we live in encourages such things. Nevertheless, at the end of the day, we either treat astrology with the reverence it deserves or we are complicit in its misuse. This is not primarily a moral issue. It is all about a consciousness and reverence of divine spirit, used for good vs corruption, in one degree or another, In short, the inspired astrologer is forever conscious of the weight of responsibility. This is not a burden, but a joy. For many people, the events of 9/11 are considered clear and fully explained. Whether these people are in the majority is another question, Still, I have no intention of addressing the still-mounting number of theories, except to point to the level of uncertainty, the improbable nature of much of the official story and the vast array of alternate theories about what happened on that bright September day in New York 17 years ago. It should, however, be borne in mind that whoever was the mastermind of the attack has not been revealed to this day. That in itself is a great mystery since the usual purpose of such attacks id to draw attention to a specific cause or to exact some form of an ultimatum. This was hitherto the way terrorist attacks worked. They usually conveyed a specific threat, yet to be delivered, or involved the taking of hostages to be used for leverage during bargaining. Anonymous terrorist attacks were virtually unheard of before the events on 9/11 in New York. We do know that Osama bin Laden stated that he admired the attack but couldn’t take credit for it. The astrological community was quick to tally who had been able to predict the event, with many saying it would be impossible to predict the precise date and the exact place. To the best of my knowledge, nobody did just that. This is the graphic representation of the Total Solar Eclipse of 11 August 1999 to which Zoller refers. One of the most fundamental rules for the judgment of an eclipse is that it must be visible to have any influence on a given area. In this case, although it is a very impressive eclipse, it is not visible on US soil. In fact, the maximum point of this eclipse is over Romania, on the other side of the world. It does, however, pass through several European and Middle Eastern countries and onward to Pakistan and India, as far as the Bay of Bengal. The duration of the eclipse was 2 min 23 s.
Again, there is no reason given for this specific information. I cannot imagine how it could have derived from consulting the eclipse alone. This account could have been written by anyone with an understanding of current events., as has been noted by others No date is given. No specific location is given. It’s would appear to be a useless prediction from that point of view because the most important utility of prediction is to warn or offer preparatory information. The US and the Western world was bracing for terrorist attacks, such as had already occurred. Elsewhere, Zoller had warned of Chinese forces working with Al Qaida in the desert, which proved to be incorrect. That refers to so many countries, many of which are in a constant state of tension It’s a throwaway line and ultimately tells us nothing. We are curious to know what else Zoller might have used but didn’t mention. Zoller could have used several other tools available to Mundane astrologers, such as various Ingress charts, Planetary Phases. Profections, Primary Directions, Lunations, Revolutions and more. If he used any of these I’m not aware of it. So, if he is telling us that the time range of the eclipse is 2.5 years, that would fit the (approx) 2,5 minutes of duration of the eclipse. But I repeat: the eclipse did not fall on US soil, we still have a wide time frame and the eastern seaboard is a massive area. Why did he not consult other elements? If he did, he doesn’t mention them with any coherence. If he was certain of the attack, why did he not warn anyone in a position to get the word out so that thousands of lives would be saved? Why does he initially make the prediction as if as a casual observer, only to claim it was really a prediction? There were two Lunar Eclipse in 1999, one on 31 January with maximum eclipse in the Philippines and the other on 28 July with maximum eclipse seen in the central Pacific. neither of these is mentioned by Zoller or any other astrologer, to the best of my knowledge. 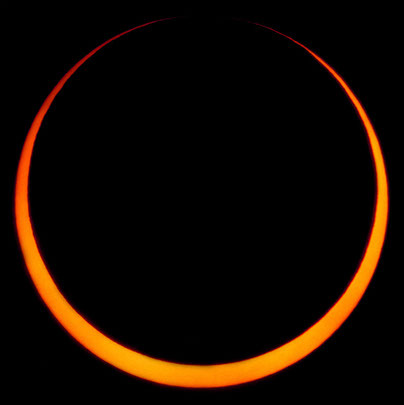 There was an Annular Solar Eclipse across Western Australia on 116 February 1999, with the maximum eclipse Again, the lack of visibility in N. America would rule out any interpretation of an event in New York. Yet Zoller refers to another eclipse that didn’t stretch to N. America either. He had predicted the election of George W. Bush, referring to him as “a younger less experienced member of the House of Bush.” It’s a prediction that many people from all walks of life might have made with confidence. but it stands out because the language reads like a mimicry of prophets such as Nostradamus. It’s as if we are being thrown off the scent at every turn, left wondering if there was anything to find in the first place. 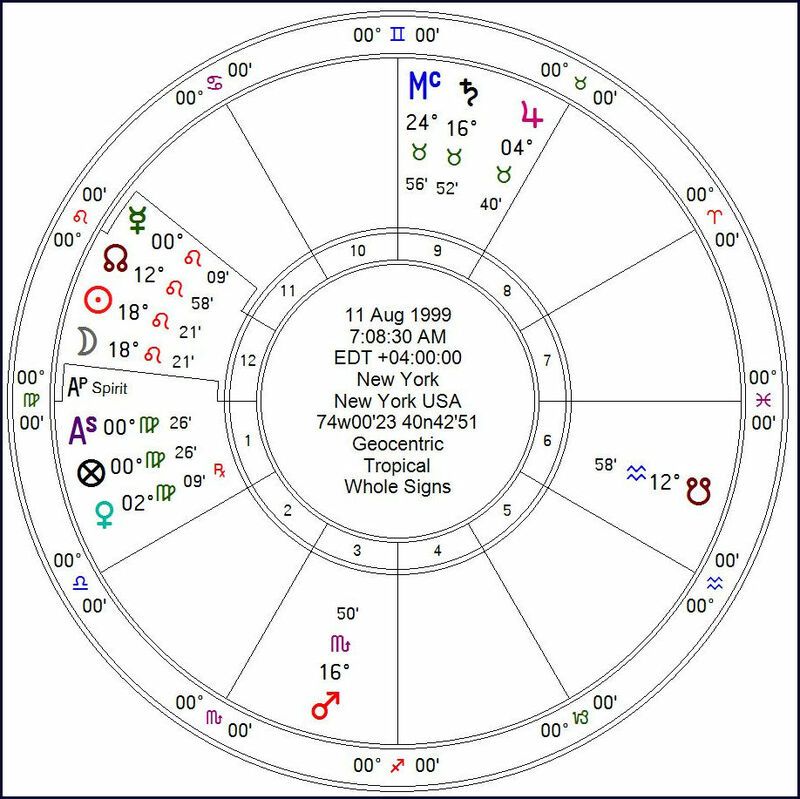 Below is a chart for the eclipse set for New York, even though it was not visible from anywhere in the Americas. We see that Saturn and Jupiter are moving into Superior Conjunction. 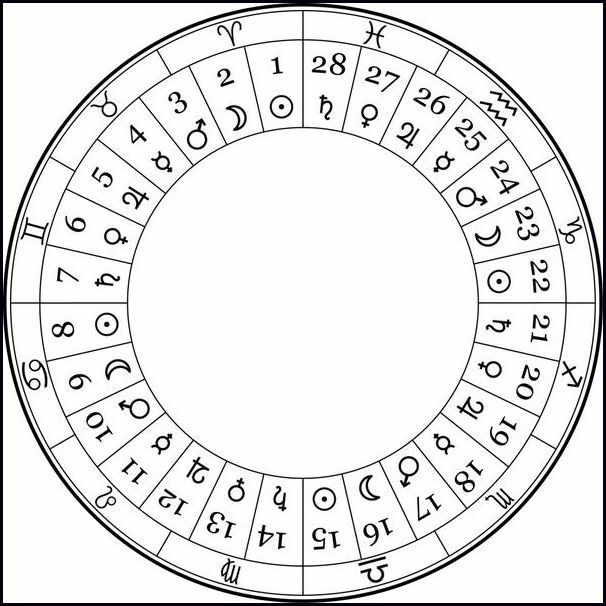 This occurs approximately every ten years and has been considered of great astrological importance since antiquity. This [henomene marks a new epoch. This consideration is crucial in most Mundane readings of this type. It hasn’t happened yet, but it soon will on 31 May 2000 The 12th House of hidden enemies is the point of the eclipse. Mars is in perfect opposition to Saturn. As with the eclipse itself, which places the stress om the alleged enemies of the US. Venus is her Fall and Retrograde, and Lady of both Saturn and Jupiter. I have no way of knowing if Zoller consulted a chart anything like this, but it seems likely considering his emphasis on the eclipse. Below is the chart for the first plane crash into the WTC. I add ir here to see, even in a general way, what Zoller might have envisioned. What was he looking at that would convince him that the attack would be from Muslim fundamentalist? 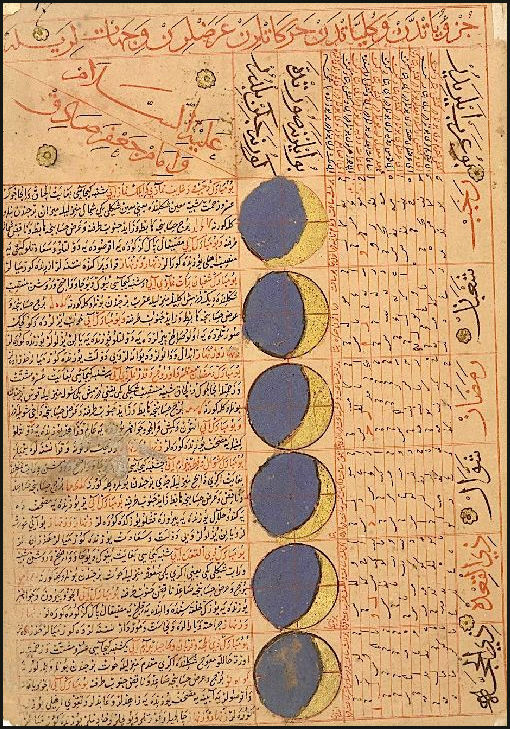 Islam is under Venus and the eclipse was in Leo. There really is no reason why Zoller would consult such a chart. unless it was after the fact. I leave it here for those wishing to examine this chart. This is by no means intended as a person or a professional attack on Robert Zoller, who has a well-founded reputation as one of the most important astrologers of his generation. However, readers have raised these questions and I thought it best to put out there for an explanation and an opportunity for discussion. Moreover, when a high profile astrologer makes such a prediction, they must expect to be questioned on how the prediction was made. The eclipse needs to be explained anew or disqualified as part of a prediction if, in fact, a prediction occurred in the first place. The one astrologer that predicted the attack to the exact day was a popular but unpretentious astrologer named Lynne Palmer who wrote: ““Avoid terrorist attacks on September 11, 2001” in her almanack. Robert Hand recognizes hers as the only accurate prediction but has not been able to discover how she arrived at such an accurate conclusion. As a footnote, there is another way of looking at this, but I see no evidence that Zoller did so. The eclipse cuts through countries such as Iraq, Iran, Syria, Pakistan and Afghanistan. This is a complete list of the countries who felt the wrath of the US military, but none of them was proven to be responsible for the 9/11 attacks. The scapegoat was primarily in Iraq and then Afghanistan. This was the question I asked at the time. If you google this subject, you are sure to come upon a critique of this alleged prediction at http://www.skepticreport.com/sr/?p=535. The writer states that ” In fact, whenever Zoller was precise, he was wrong. Whenever he was waffling, he now claims accuracy. ” These are harsh words, but, as always, extraordinary claims require extraordinary evidence. Icon of Archangel Michael (detail), Yaroslavl, 1216. The constellation of Taurus holds the red eye of Aldebaran (Tascheter) the Watcher of the East. He is almost universally considered to the be the Watcher of the Pleiades. 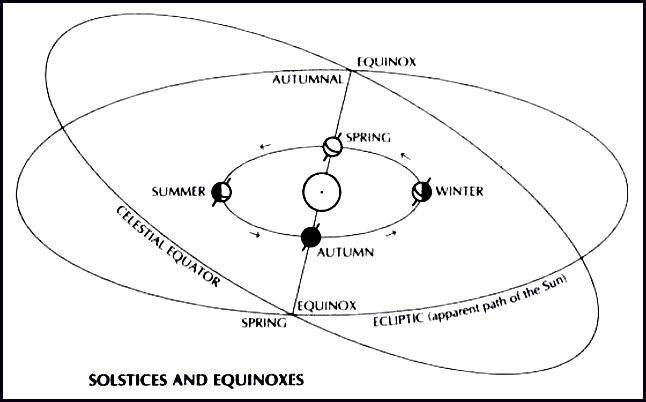 The association is with the Spring Equinox when the system was conceived. 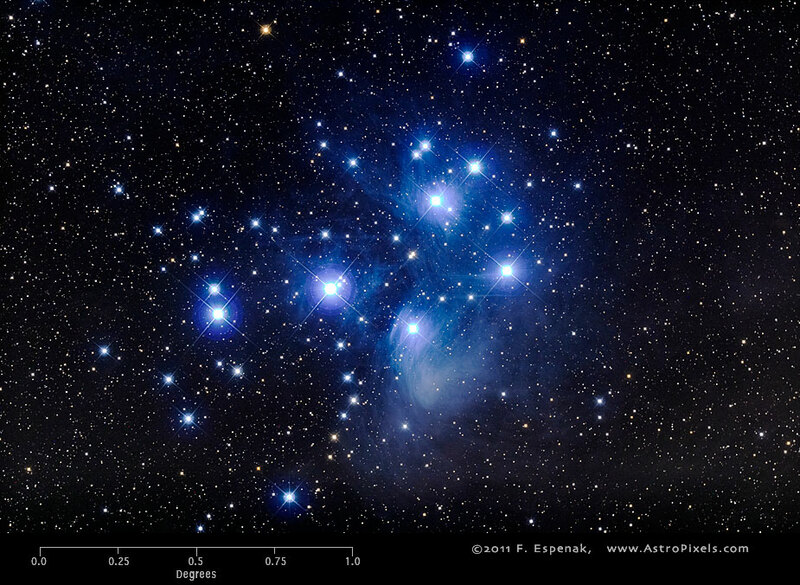 The Pleiades are associated with rain and even tears. To suffer a dry Spring was considered a bad omen indeed, as crops would fail. “The Bull will dower the countryside with honest farmers and will come as a source of toil into their peaceful lives; it will bestow, not gifts of glory, but the fruits of the earth. It bows its neck amid the stars and of itself demands a yoke for its shoulders. When it carries the sun’s orb on its horns, it bids battle with the soil begin and rouses the fallow land to its former cultivation, itself leading the work, for it neither pauses in the furrows nor relaxes its breast in the dust. The sign of the Bull has produced a Serranus and a Curius, has carried the rods of office through the fields, and has left its plough to become a dictator [eque suo dictator venit aratro]. Its sons have the love of unsung excellence: their hearts and bodies derive strength from a massiveness that is slow to move, whilst in their faces dwells the boy-god Love (Cupido).” [Astronomica, Manilius, 1st century AD, book 4, p.233]. In the image of the Bull from the Lascaux caves, we find that the astronomical detail is stunning. The Bull is enmeshed in the Hyades, with the Pleiades clearly articulated just above him. You can also see the belt of Orion. 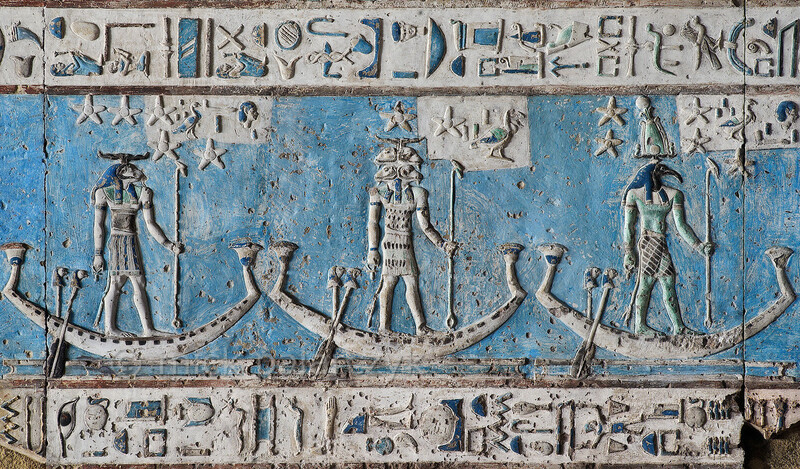 That we have such a clear a Neolithic representation of the constellation is a testimony to how long the heavens have held a particular meaning for us and also that there has been far less changing in our interpretations than we might reasonably expect. Of course, this begs the question why. The Angel of the East is Michael the Archangel. He is best known as something of an Avenging Angel but is more properly known as a protecting Angel. His sword is always ready. The East is the place of the Sunrise and the beginning of things. This is what Vivian Robson says about Alderaban: “It gives honor, intelligence, eloquence, steadfastness, integrity, popularity, courage, ferocity, a tendency to sedition, a responsible position, public honors and gain of power and wealth through others, but its benefits seldom prove lasting and there is also danger of violence and sickness. 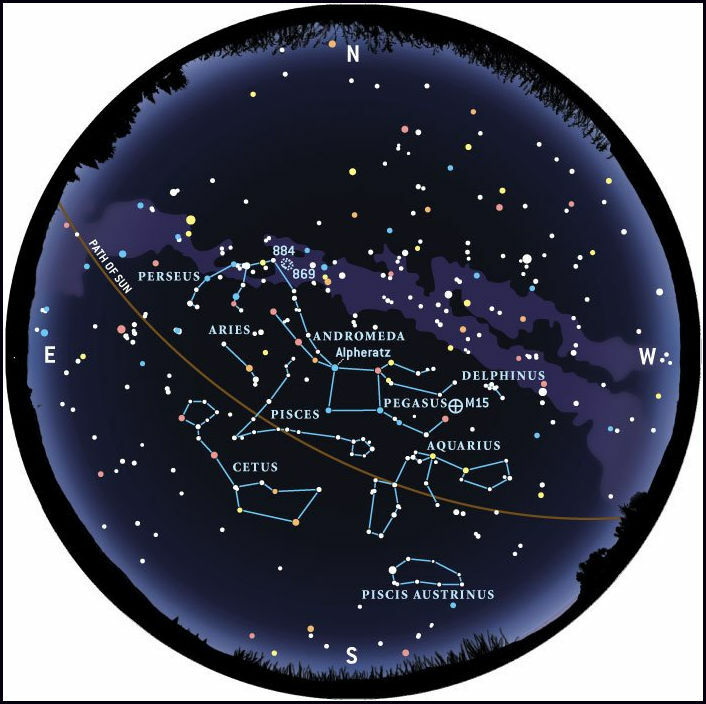 [Fixed Stars & Constellations in Astrology. p.120.] 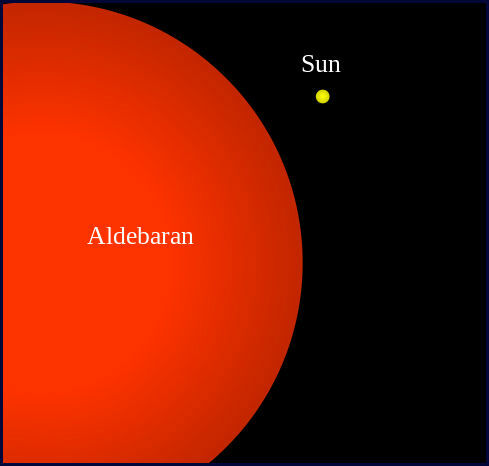 Aldebaran is known as the Eye of God but also associated with blindness. Many of these attributes are the blessings and shortfalls of youth. We are facing the origins of creation. We can’t forget that this is the element of Earth or that the Hebrew meanings are oxen in the sense of the yoked power of the Bull, Aleph is the first letter of the Hebrew alphabets and speaks to powerful potential. 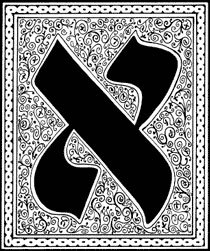 The name aleph is originally derived from the West Semitic word for “ox”, and the shape of the letter derives from a Proto-Sinaitic glyph. It is thought that this glyph was in turn based on Egyptian hieroglyph, however, I find insufficient evidence of the last claim. The tarot card that embodies this quite consciously is The Fool. The Fool is in a sense outside of the system and has the value of zero and perfect potential. 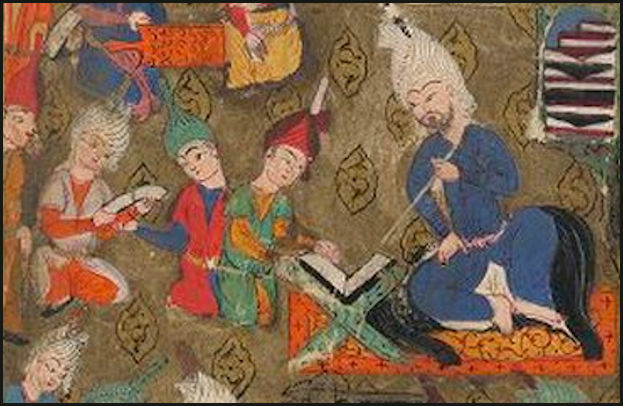 In mosy decks, the Fool is shown with a staff with a sack over his shoulder, which is undeniably associated with virility. the Fool is youth personified: optimistic for no particular reason and most of all, unaware of the potency he carries and is about to walk off a cliff while sniffing a flower. The name Aldebaran (pronounced /ælˈdɛbərən/) comes from the Arabic word al-dabarān, meaning “the follower.” The name refers to the Pleiades cluster (Messier 45), which the star appears to be following across the sky. On the 12th of May, 1706, there was stunning Total Solar Eclipse, with the Path of Totality running through the heart of Europe, from Southern Scandinavia through Spain. 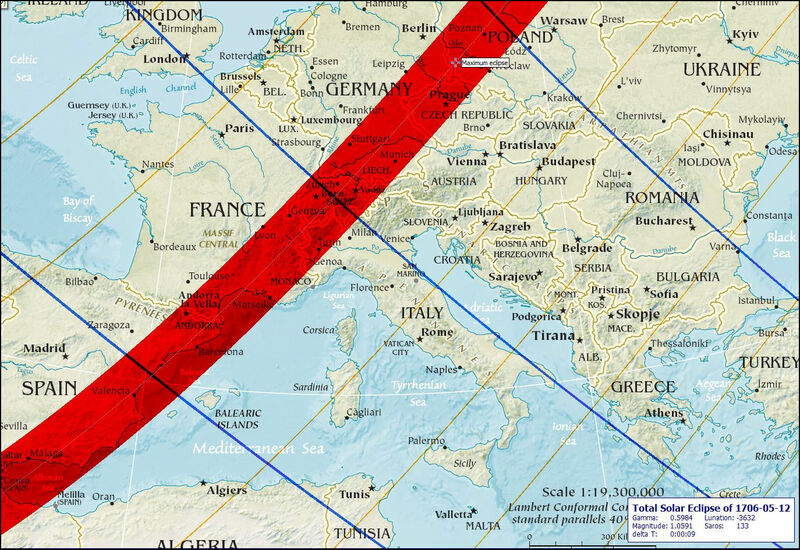 The chart for the eclipse in Castiglione Savarese, a town now in Northern Italy looks very ominous indeed. 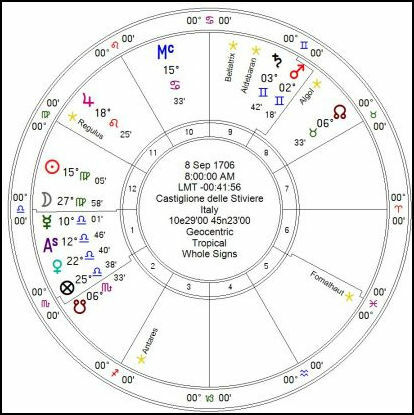 Any astrologer reading this chart would have taken it as a harbinger of things to come, particularly knowing the strategic value of their city and the.extreme turbulence of Europe, involving several powerful countries jockeying for increased wealth and hegemony. This needs to be said because making a prediction of an event that cannot possibly take place, such as a major earthquake in an area that has no significant seismic threat or to push the point further to predict a tsunami in Mongolia. When predictions are made, it is to the great advantage of the practitioner to take realities into account. This includes political realities. The path of the eclipse also looks like a visual depiction of the Swedish army’s sweep through Europe, over the Alps as it races from one conflict to another. or the French army under Louis d’Aubusson de La Feuillade marching to a decisive and assured victory. The eclipse was exact for that location at 10.20 AM. The Sun eclipsed by the Moon in the 21st-degree of Taurus, which conjuncts Algol, the most pernicious star in the heavens. Furthermore, Algol is between the eclipsed Sun and Saturn. This configuration in the Tenth House augurs for the fall of Castiglioni. 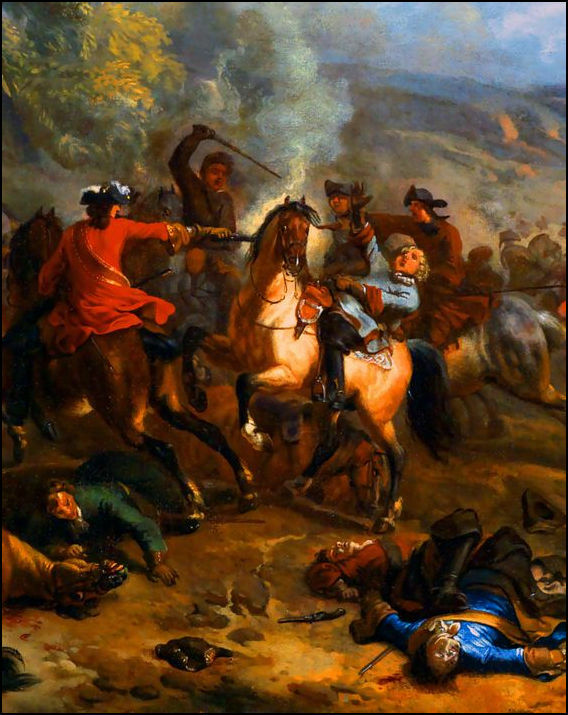 This is not to be confused with the more famous battle at the same location on August 5, 1796. We are now in a position to see the progressions and comparisons of the two charts. Saturn has moved to conjunct Mars in the Ninth House and we can fairly read that as indicative of the foreign invaders, particularly with Aries opposing the city’s Ascendant in Libra. The lights are now weak in the 12th House and acting as hidden enemies. Saturn is Almuten of the First and fifth House in the Hour of Saturn. 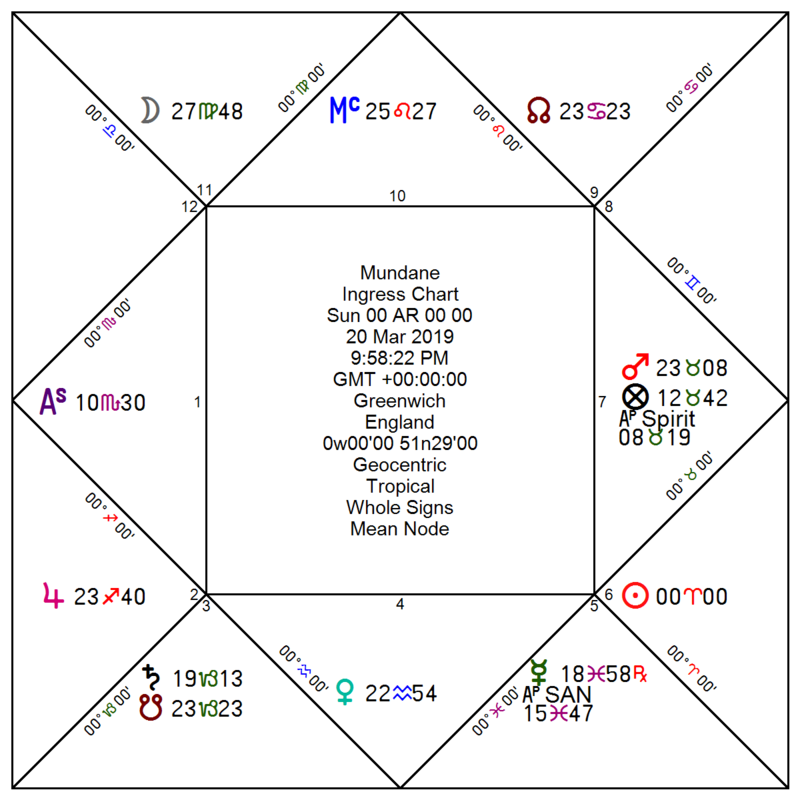 The chart Almuten is Mercury.The Scorpio/Taurus Axis of the Nodes in the Axis of Hades reflects themes of the Eclipse.